Before 1720: son of Arashi Sanjûrô I, his first stage name was Arashi Tomimatsu. 11th lunar month of 1727: Arashi Sanjûrô I and his son Arashi Tomimatsu respectively took the names of Arashi Sanjûrô I (using a new writing with the "mountain" ideogram for san) and Arashi Sanjûrô II (using the classic writing with the "three" ideogram for san); the new Sanjûrô became both tachiyaku and zamoto, producing at the Kado no Shibai the kaomise drama "Onna Kabuki Chiyo no Hajime". 9th lunar month of 1729: Sanjûrô produced at the Kado no Shibai the drama "Keisei Oki no Ishi", which celebrated the shûmei of Yoshizawa Ayame II. 11th lunar month of 1729: Sanjûrô produced at the Kado no Shibai the kaomise drama "Banzai Kogane Tsukuri"; his stage partners were Nakayama Shinkurô I, Yoshizawa Ayame II, Yamashita Kinsaku I, Kirinoya Gonjûrô I, Sakurayama Shirosaburô I, Nakamura Sôjûrô and Fujii Hanamatsu. 11th lunar month of 1730: Sanjûrô played at the Naka no Shibai the role of Jûnai in the kaomise drama "Meotogura Wagô no Nakatomi", which was produced by Iwai Hanshirô III; his stage partners were Nakayama Shinkurô I, Anegawa Shinshirô I, Kirinoya Gonjûrô I, Sakurayama Shirosaburô I, Yamashita Kinsaku I, Sanogawa Hanazuma I, Hanagiri Toyomatsu I and Izumikawa Sennosuke. 12th lunar month of 1731: Sanjûrô played at the Naka no Shibai the role of Takashima Kinpeiji in the kaomise drama "Ôyamato Wagô no Tsuchi", which was produced by Iwai Hanshirô III. 1st lunar month of 1732: Sanjûrô's rank in the Ôsaka hyôbanki, tachiyaku section, was jô-jô (superior - superior). He shared the same rank with Nakamura Shirogorô II, Kirinoya Tôkurô and Iwai Hanshirô III. 11th lunar month of 1732: Sanjûrô played at the Kado no Shibai the role of Umeyama Matsutarô in the kaomise drama "Mitsu no Hama Kogane no Irie", which was produced by Arashi San'emon III. 1st lunar month of 1733: Sanjûrô's rank in the Ôsaka hyôbanki, tachiyaku section, was jô-jô-hankichi (superior - superior - half excellent). 11th lunar month of 1733: Sanjûrô played at the Naka no Shibai in the kaomise drama "Genji Rokujûjô". 1st lunar month of 1734: Sanjûrô's rank in the Ôsaka hyôbanki, tachiyaku section, was jô-jô-(hanshiro)kichi (superior - superior - almost excellent). 11th lunar month of 1736: Sanjûrô played at the Naka no Shibai in the kaomise drama "Furômon Kon no Shikigawara"; his stage partners were Nakayama Shinkurô I (the zamoto), Arashi San'emon III, Sanogawa Hanazuma I, Yamashita Matatarô I, Nakamura Jûzô I and Fujikawa Heikurô. 11th lunar month of 1737: Sanjûrô played at the Naka no Shibai in the kaomise drama "Fukakusa-no-In Sannô no Maki", which was produced by Nakayama Shinkurô I. 11th lunar month of 1738: Sanjûrô played at the Kado no Shibai the role of the rônin Takazuka Hikokurô in the kaomise drama "Sanpukutsui Kogane no Ichigura", which was produced by Nakamura Jûzô I. 1st lunar month of 1741: Sanjûrô's rank in the Ôsaka hyôbanki, tachiyaku section, was jô-jô-kichi (superior - superior - excellent). He shared the same rank with Ôtani Hiroji I, Anegawa Shinshirô I, Ichiyama Sukegorô I, Nakamura Shingorô I, Nakamura Jûzô I and Yamamoto Kyôshirô I. 1st lunar month of 1743: Sanjûrô's rank in the Ôsaka hyôbanki, tachiyaku section, was only one black stroke below jô-jô-kichi [visual]. He played at the Naka no Shibai the role of Yagi Gonroku in the drama "Kurofune Isse Ichidai Otoko", which was produced by Anegawa Shinshirô I [casting]. 11th lunar month of 1744: Sanjûrô produced at the Kado no Shibai the kaomise drama "Yamazaki Yojibê Imayô Sugata". 11th lunar month of 1745: Sanjûrô produced at the Kado no Shibai the kaomise drama "Murakami Genji Kogane no Niiyakata". 12th lunar month of 1745: the drama "Natsu Matsuri Naniwa Kagami" was staged for the first time in Ôsaka, simultaneously in the three major theaters of the city; Sanjûrô played the role of Danshichi Kurobê at the Kado no Shibai [casting]. 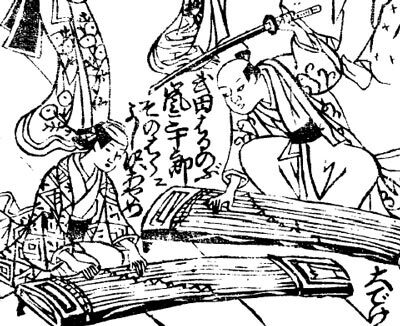 11th lunar month of 1747: Sanjûrô played at the Naka no Shibai in the kaomise drama "Kogane-bana Michinoku Jikki", which was produced by Ichikawa Ryûzô and celebrated the shûmei of Yamatoya Jinbê IV. 1st lunar month of 1748: Sanjûrô's rank in the Ôsaka hyôbanki, tachiyaku section, was back to jô-jô-kichi (superior - superior - excellent). 12th lunar month of 1748: the play "Kanadehon Chûshingura", which was originally written for the puppet theater and staged for the first time in the 8th lunar month of 1748 in Ôsaka at the Takemotoza, was adapted for Kabuki for the first time, in Ôsaka at the Kado no Shibai; Sanjûrô played the roles of Ôboshi Yuranosuke and Hayano Kanpei [casting]. 11th lunar month of 1749: Sanjûrô played at the Ônishi no Shibai in Izumiya Shôzô's kaomise drama "Kotobuki Kogane no Kachi Ikusa", which was produced by Mimasu Daigorô I, welcomed back in Ôsaka Iwai Hanshirô III and celebrated the shûmei of Murayama Heijûrô IV. 20th day of the 5th lunar month of 1750: Sanjûrô died in Ôsaka. Arashi Sanjûrô II was a popular tachiyaku actor, who achieved fame for himself in Ôsaka during the first half of the 18th century. He excelled in jidaimono dramas, especially in jitsugoto or budôgoto roles. He was recorded in the "Kabuki Jinmei Jiten" as being the master of Arashi San'emon VI. It was not possible for one reason: Arashi Sanjûrô II died in 1750, 10 years before the birth of Arashi San'emon VI.